Stop and revel in the beauty here for a moment will you? 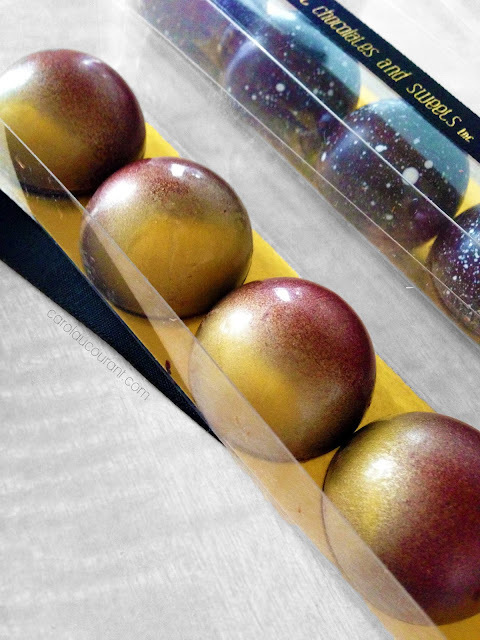 Clearly these bonbons were created by a true artist. 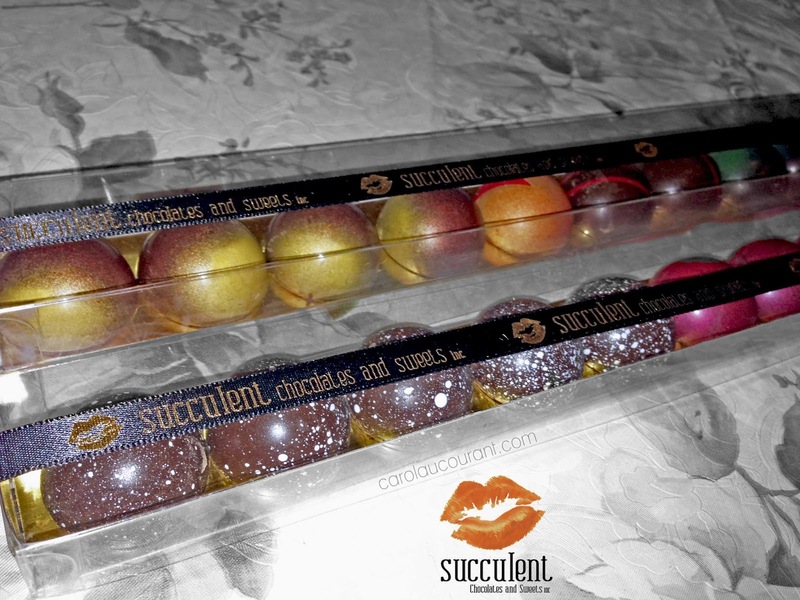 Not only are these bonbons elegant and attractive to the eye but biting into a Succulent Chocolate, you’ll find that they are rich and luscious. Guilt-free indulgences made from pure and natural ingredients. 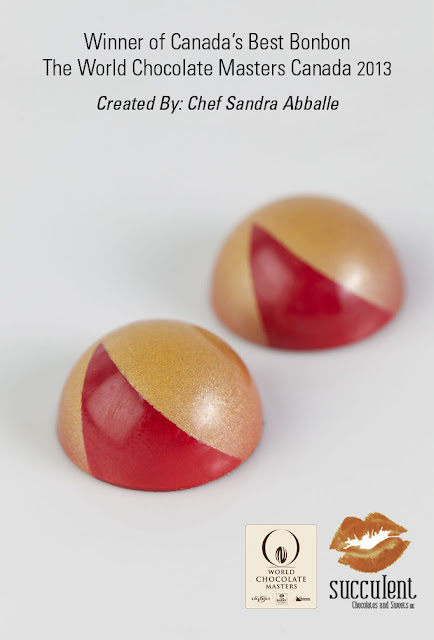 All their bonbons are hand painted and hand made using the finest quality couverature chocolate using 100% fruit, real nuts, 35% cream and butter to create the ultimate flavour impact. Each bon bon is hand sprayed with different cocoa butter colours to achieve a unique look. You can really see how labor-intensive and lovely these mini morsels of delight are. I had the pleasure of meeting with the Artist behind Succulent Chocolates, Sandra Abballe. 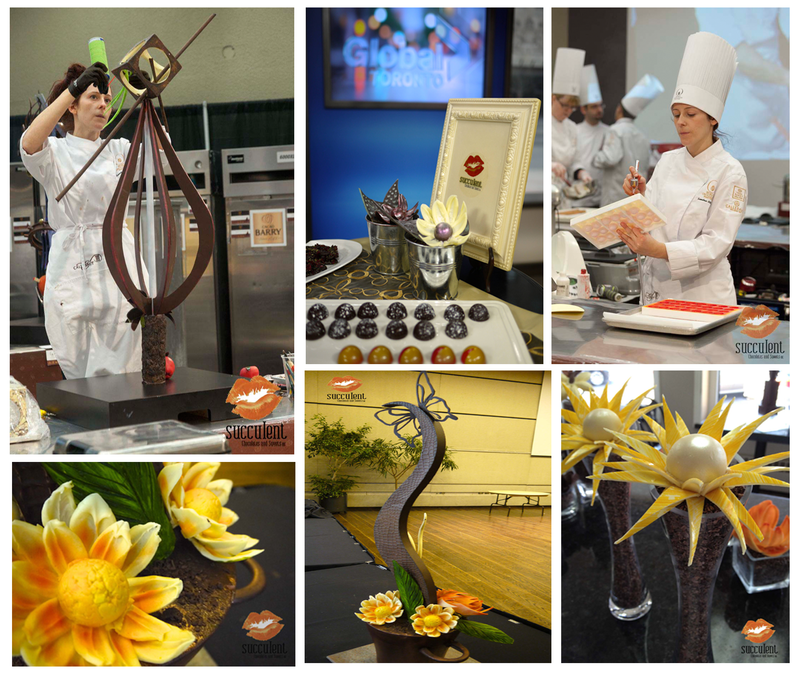 Her passion and love for her craft was evident and it was so interesting to learn more about her, her work and chocolate! 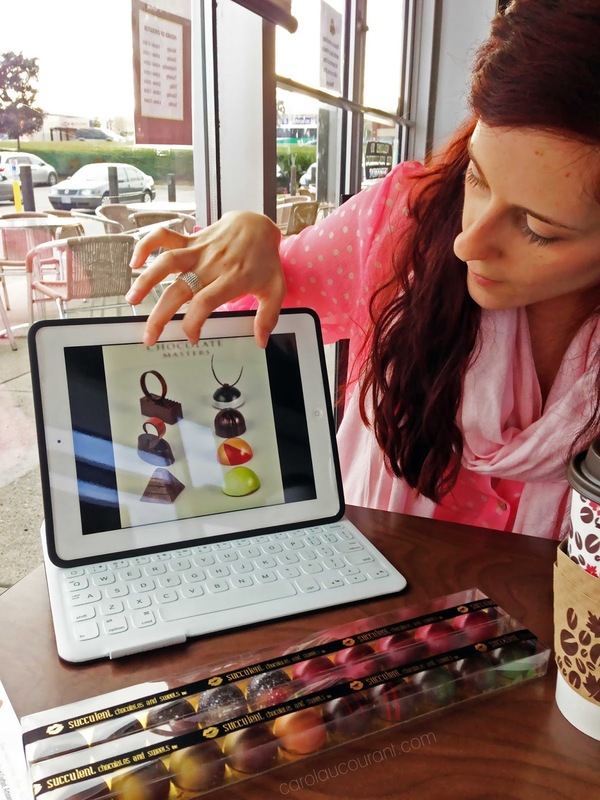 Prior to chatting, I honestly wasn’t as educated about Cacao. Did you know Cacao is known to improve digestion and stimulate kidney and bowel function? I didn’t know the real difference between Cacao and Cocoa. Did you? They sound alike, so what’s the difference? Cacao typically refers to the actual bean, while cocoa is the chocolate powder that you can find at the store. When you see a chocolate bar labeled with a cacao percentage, it’s referring to the amount of solid cacao beans that are actually in the chocolate bar vs. the amount of sugar. The more cacao, the less sweet the chocolate will be. What’s your favourite kind of chocolate? I personally love Milk and Dark best! So what role does Cacao play in these? Dark chocolate is typically “purer,” chocolate and that’s where you’d find those cacao percentages we mentioned before. In fact, to be marketed as “dark chocolate,” in Europe, the chocolate must contain at least 35% cacao. It also has the most health benefits of the three. Inspired by chocolate milk, milk chocolate wasn’t invented until the 1870s (which is really not that long ago in the scheme of foodie things). Combined with milk and sugar, here in the States milk chocolate only needs 10% cacao to be considered chocolate. Considered a chocolate derivative, white chocolate isn’t really chocolate. It normally has cocoa butter, sugar, and milk, but no cacao solids, making it more like a chocolate relative than anythingelse. Antioxidant compounds called Flavenoids, which have anti-inflammatory compounds that have been shown to improve heart health. Flavenoids are also great for your skin and can help prevent sun damage! Phenylethylamine, the chemical that your brain creates to release endorphins when you fall in love, meaning chocolate can improve mood. Magnesium, Potassium, and Iron, all of which are good for your heart. Some studies have also shown that chocolate is good for your brain, circulation, and blood sugar too! Thanks for the mini-class, Sandra! We sat in a bustling Second Cup and I listened to her share her craftship over a London Fog Latté amazed at how much effort and dedication she puts in her chocolates. 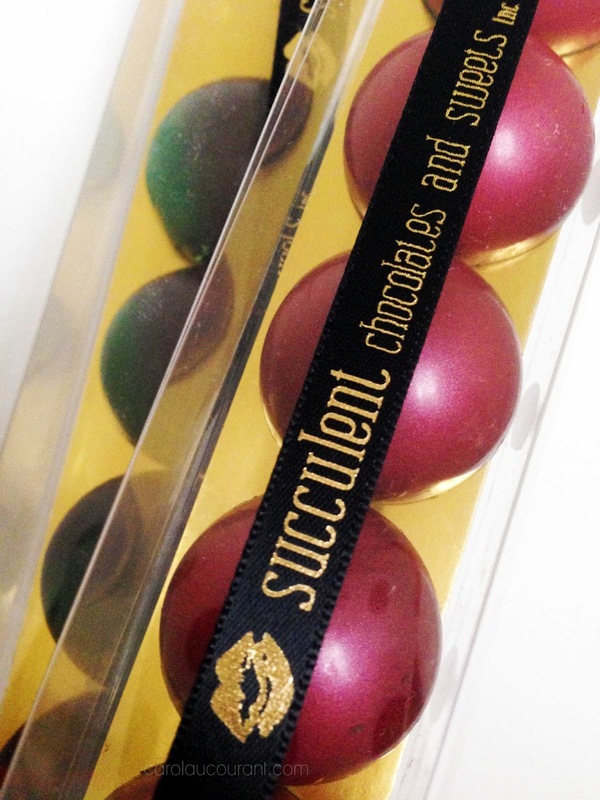 We even had eavesdroppers beside is completely intrigued in our discussion about Succulent Chocolates. This is what was in the beautiful packaging. I have to say I fell smitten with the Coconut Bonbon with real pieces of coconut inside and of course her award-winning “The Crunchy Apple” composed of freshly diced and caramelized apples combined with chopped oven-roasted peanuts. The crunchy layer of the Bon Bon is paired with a creamy salted peanut butter ganache. Yummy! Anything chocolate and peanut butter is a winner in my books. 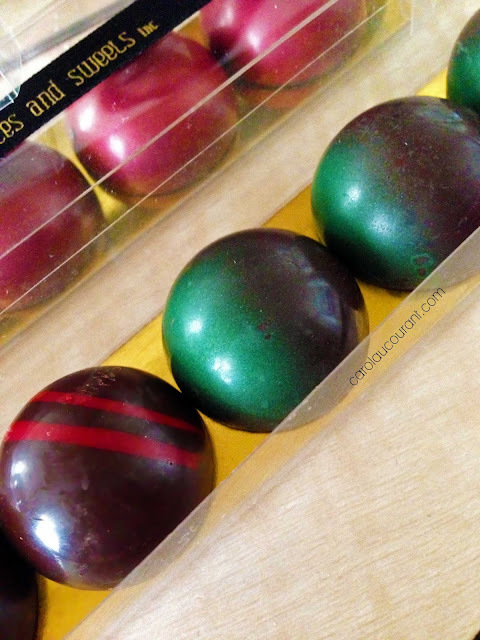 I also enjoyed the Espresso Bean Bonbon which is infused with authentic Italian espresso beans. A great pick-me-up! You can really taste the quality in these chocolates. For someone that loves chocolates as much as I do and has had the pleasure of sampling some of the best around the world, including Paris and Switzerland, I have to say, I am thoroughly impressed. I really loved the presentation. These would make the perfect bonbonnieres for weddings and other special events especially since Sandra is able to customize them according to the colour theme of your event. The only thing I would say would make the packaging a little better would be if it had the ability to seal shut without having to tie the ribbon around it in case you wanted to save some bonbons for a later treat. 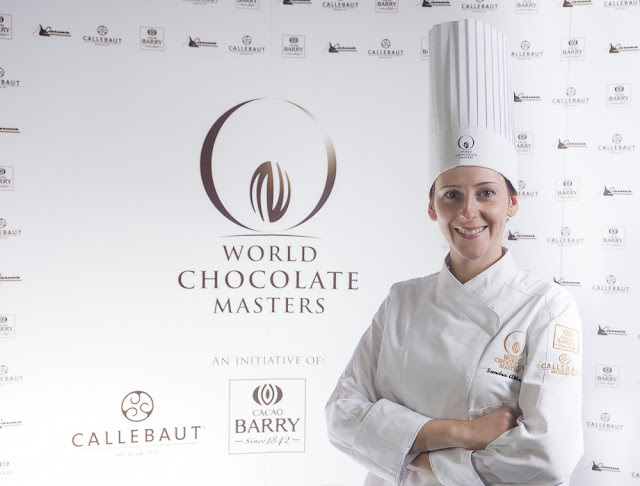 Currently, Sandra is in the process of completing her next stage in her business with a Chocolate Lab where she can create her goodies and even be able to host Private Chocolate-Making Workshops. On top of this, she also provides Chocolate and Wine Pairing Parties. Sign me up for that! Another perfect combination – wine and chocolate. To learn more about Succulent Chocolates, visit http://www.succulentchocolates.com. You can also follow along on Twitter & Facebook and drool over beautiful photographs on Instagram and Pinterest. Mmmm chocolate! I want to eat this so badly right now! This would be an amazing Valentine’s Day gift! Wow! Those chocolate looks amazing. So pretty and they probably tastes out of this world. I am so jealous. Oh my goodness those look so decadent! Thanks for the review! My sister is getting married next year and I will surely share this with her. I love the style of them – so pretty!